Planting your own fruit trees is a great way to increase the edibles in your yard, provide a food source for pollinators, and a beautiful addition to the landscape. 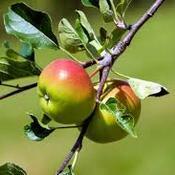 Bareroot fruit trees are an affordable option for Spring planting. These trees are locally grown and are grafted on cold hardy, semi-dwarf root stock. Please be aware that most fruit trees require another tree of the same species, but different variety, in order to cross-pollinate. This is a bareroot product: there is no soil on the roots, and requires immediate planting. Tree height is 4 to 5 feet tall. ***This is not a shippable product. Pickup is at the nursery the last week of April, and first week of May. Excellent fresh or for cooking; keeps well..
Early,cold-tolerant; large fruit for eating.. Very hardy; productive and vigorous; quality..
Good to eat or can; short, stout and hardy; blue fruit..